Some of my fellow Canadians are getting snowed on already! To help warm things up, I'm having a HUGE sale on my patterns from now through the weekend. 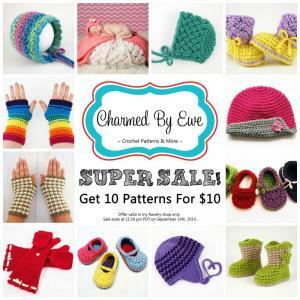 Get any 10 patterns in my Ravelry shop for just 10 dollars! Minimum purchase of 10 items required. Just add the patterns to your cart and the discount will automatically be applied. Sale ends at 11:59 pm PDT on September 14, 2014. Happy shopping!